It’s not easy to take yourself on a date. In fact, even though Julia Cameron suggests you do this in The Artist’s Way, (which I’ve been dutifully following since January by writing daily morning pages) she also knows that you (and when I say you, I mean I) will try and weasel out of it. Walking through the arboretum on Ann Arbor’s first hot day. An artist’s date is a block of time, perhaps two hours weekly, especially set aside and committed to nurturing your creative consciousness, your inner artist. It might be a visit to a great junk store, a solo trip to the beach, a visit to an aquarium or an art gallery— these cost time, not money. It might be a long country walk, a solitary expedition to the beach for a sunrise or sunset, a sortie out to a strange church to hear gospel music, to an ethnic neighborhood to taste foreign sights and sounds— your artist might enjoy any of these. Or your artist might like bowling. Commit yourself to a weekly artist’s date, and then watch your killjoy side try to wriggle out of it. Watch how this sacred time gets easily encroached upon. But I knew I was meeting a friend to talk about The Artist’s Way. I HAD to have an artist’s date to report. I am so grateful for this. Otherwise I would never have gotten my buttskie out the doorskie. Little did I know I’d be able to write around 300 words illustrated by six or so photos in just 15 minutes. Peonies looking like red licorice. I took a walk there yesterday from my office–about 25 minutes to get there. I know at this point I only have minutes to record my story. When I walked into the park, I saw a redheaded young man in purple shorts and no shirt staring at his phone either pre-run or post run and then another young man run by that looks similar to him except he has dark hair and he’s wearing UM shorts, okay really he looks nothing like the first guy except he also happens to be a fit male shirtless runner. My face is wet with sweat and there is not a cloud in the sky. 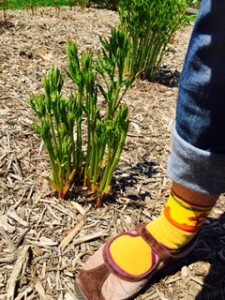 The patches of peonies are between 6 inches high to knee-high. The red ones look a lot like red licorice, and the green ones look a lot like skinny celery. A few people were sitting around on blankets. Some young women are with babies. Another woman is holding a yoga mat and walking her little dog. 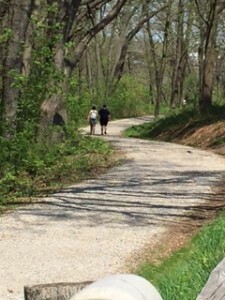 Some other people are sitting on a bench across from me, and a young couple are walking down a path, holding hands. There is no way that I would possibly be here if I wasn’t going to be meeting with someone, and no way that I would be doing this also if I didn’t feel like I needed to schedule an artist date. She’s absolutely right (Cameron)– I can’t believe that I might’ve missed this. Everyone around me is wearing shorts or dresses. I think I might be the only idiot here actually wearing long jeans, okay I rolled them up, but they are still long jeans. Sweat is dripping down my back. But at least I’m out and about. 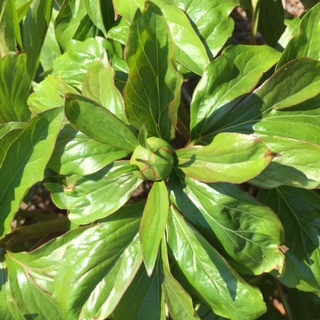 The biggest peony buds are the size of Hershey’s kisses. A bud the size of a Hershey’s kiss. Long pants rolled up on a hot day are not my best look. And if you are curious, go to the Ann Arbor District Library and listen to this talk on May 19 at 7:30. 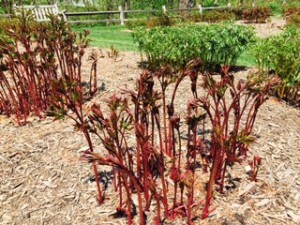 Fleeting Beauty, Enduring Value: the Peony Garden at the Nichols Arboretum. Have you seen Ann Arbor’s Peony Garden? It’s worth the trip.